When one vintrace client dispatches bulk wine to another vintrace client, using an eBOL (Electronic Bill of Lading) file can be used to speed up data entry and prevent any mistakes. After recording a bulk wine dispatch you will need to find your dispatch under Search > Dispatch search. You can search by date, dispatch number or who the wine was sent to. Click the entry and you will be prompted with a number of options one of which is titled eBOL. This will download an .xml file which you can then save and email to the receiving winery. Prior to entering the bulk wine intake it is recommended to set up an External Code Mapping under Winery Setup > Miscellaneous > External Codes. Doing this will save any configuration differences between your vintrace database and the sending wineries so you don't have to fill these out each time. The Code required will be the sending wineries vintrace customer code. 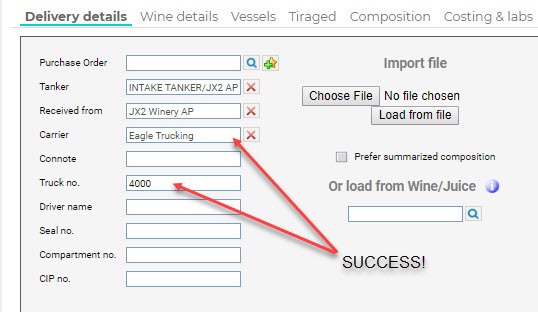 When ready to import the file you can use a Bulk Wine Intake operation from the Operations menu. Use the Import File option and select the eBOL file with the .xml extension that you received and then Load from file will read the file and pre-fill your bulk intake. If there are any fields in the eBOL that do not match to anything in your vintrace database, you will see the below screen. In the example the file contained a variety with a code of 'CAS', so you will need to provide the varietal in the Entity field to map to it. Once all the mappings are completed you should have the data populated for you on the bulk intake. This will include all of the composition details and any additive or lab results supplied. You will need to include the vessels and final volumes prior to saving the operation. Detailed composition for bulk wine, by year, variety and region.